“Winter Sunshine Chocolate” Orange Cake- A bright spot on a gray winter day. Cake layers infused with oranges nestled luxurious silky orange scented dark chocolate mousse. Enrobed in a delicate chocolate Italian meringue buttercream and orange scented ganache. Final embellishments of handmade dark chocolate blood orange truffles, intense orange chocolate bark with finely chopped almonds and chocolate dipped candied orange peel. Chocolate, Chocolate and more Chocolate ! – A chocolate cookie crust is foundation for this chocolate peanut butter lovers delight. A creamy sweet layer of peanut butter cheesecake is baked on a fudgy brownie layer of goodness topped with a decadent layer of chocolate cheesecake. A waterfall of smooth dark chocolate ganache flowing down the sides garnished with Reeses cups on top with mounds of peanut butter and grated Hershey bar topping. Ferrero Rocher Cake – Looking for a unique cake? Look no farther than this Ferrero Rocher Cake. 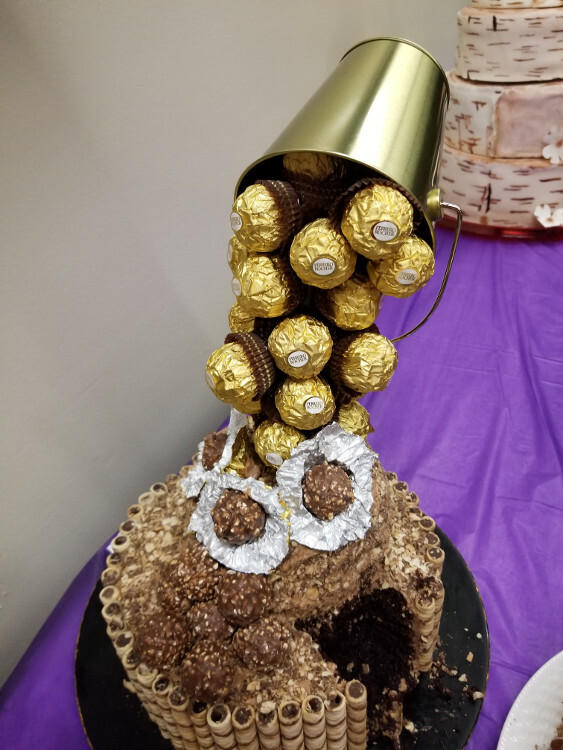 It is a fun 2 tier anti gravity cake that show the process of unwrapping a Rocher. Pirouette wafers surround a moist chocolate cake with hazelnut frosting. See the process of unwrapping a delicious Ferrero Rocher as they fall from a box in the air!